At first glance, Las Vegas isn't the most dog friendly destination. It's a city teeming with people and mega resort hotels with seemingly endless hallways that let's face it ... your dog might not make it down before they have an accident. Luckily for those of us who love to travel with our dogs, some Vegas hotels are starting to work to accommodate dogs and some even welcome them with open arms like we discovered while visiting Delano where we received a media rate and free concierge services for Niki Belle. 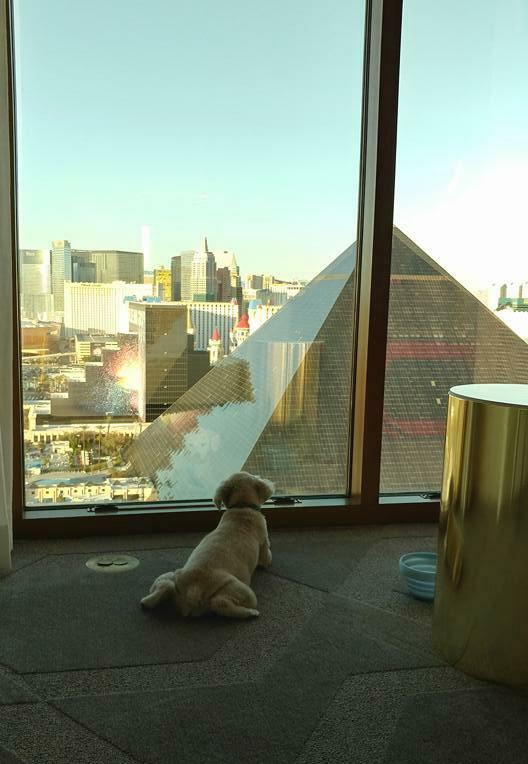 What Las Vegas Strip Hotels Are Pet Friendly? However, you will find that like human accommodations, pet fees and conditions span the gamut. For instance, dogs at Vdara are welcome in one of their VDog Suites (up to two dogs with a combined weight of 70 pounds) for a $75/day fee and a $75 cleaning fee per stay and they even have a walking path with real grass. Delano's dog policy but is $75/day/dog but you can have up to two dogs with a combined weight of 100 pounds. 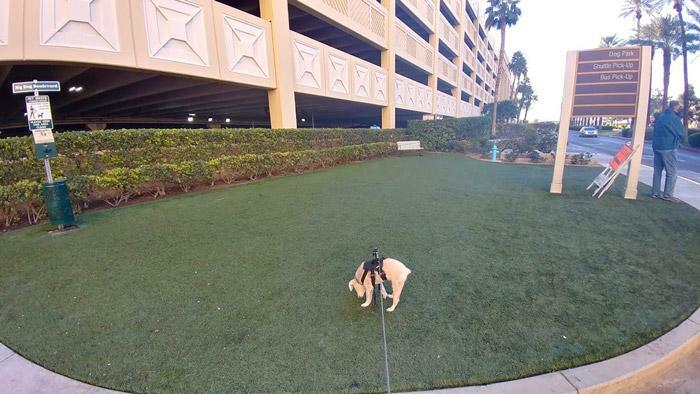 Delano does not offer a walking path, but has a large pet relief area with artificial turf and a long strip of real grass that you can also use though it sits between the in/out roads to the self parking area of Mandalay Bay Resort. Since you are already invested in taking your dog with you on your Las Vegas getaway, it's only fair that she or he gets to experience the best that the city can offer. 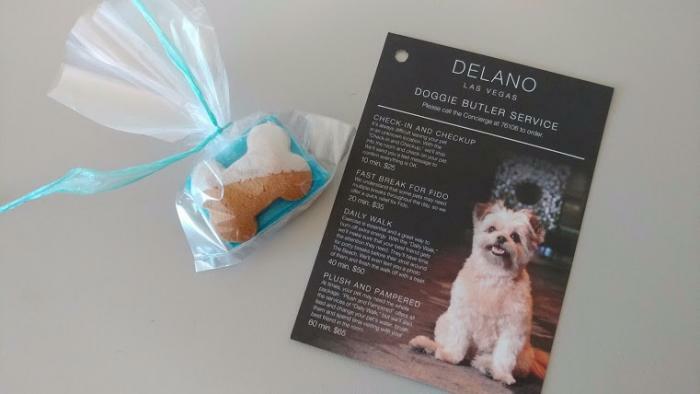 In the case of our visit to Delano, this included access to a Doggie Butler and Room Service. These butler services range from being able to arrange that one of their staff comes in and does a quick check to make sure they are doing ok as well as the full "Plush and Pampered" package that incudes a daily walk, fresh water change, and brushing as well as playtime. Niki enjoyed her room service - especially the Chow Hound Chicken Hash (poached, organic, free-range chicken with steamed asparagus and broccolini) and the Street Treats (unsalted pretzel bites). This isn't stuff out of a can, these meals come prepared fresh and while I didn't try the hash, the pretzel bites were actually quite good as snack for people too (though I added salt). 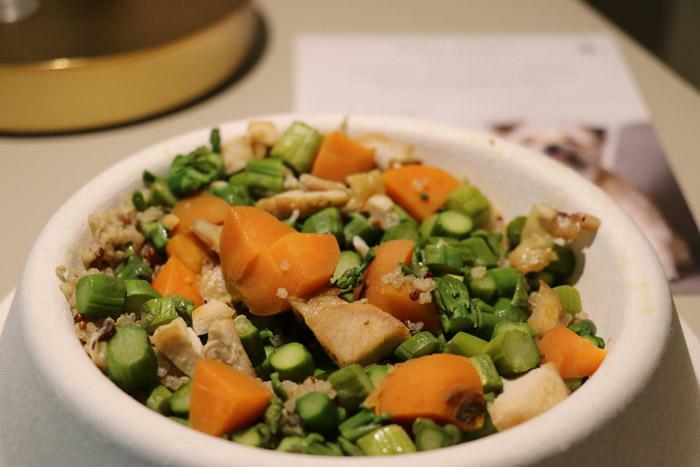 For breakfast, Niki talso tried the Canin Scramble (egg whites with broccolini and quinoa) but she didn't like that as much ... I guess she's like her dad who's not a fan of quinoa either. Niki enjoyed her room service - especially the Chow Hound Chicken Hash (poached, organic, free-range chicken with steamed asparagus and broccolini) and the Street Treats (unsalted pretzel bites). This isn't stuff out of a can, these meals come prepared fresh and while I didn't try the hash, the pretzel bites were actually quite good as snack for people too (though I added salt). For breakfast, Niki also tried the Canin Scramble (egg whites with broccolini and quinoa) but she didn't like that as much ... I guess she's like her dad who's not a fan of quinoa either. Vegas has a surprisingly variable temperature. While most people just assume that it is always hot, that's not the case ... but when it is it is VERY HOT. 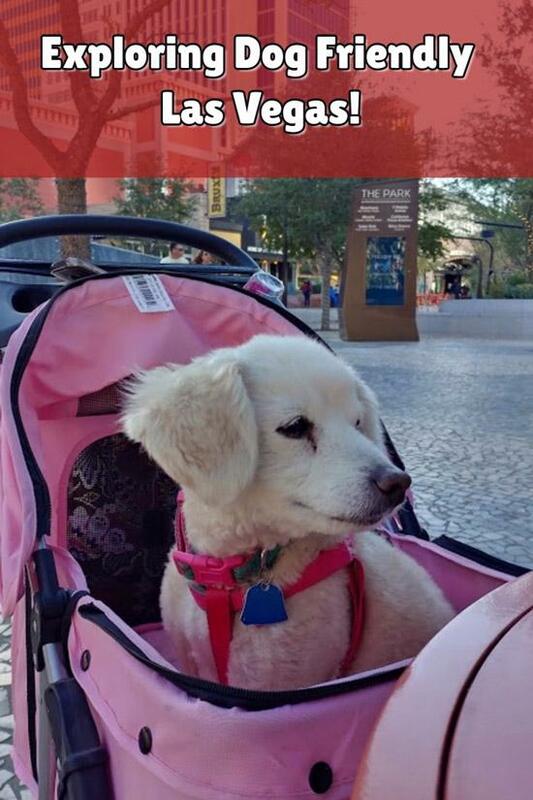 As a result, I would suggest that you bring a stroller for mid-sized dogs and consider doggie shoes as well to protect them from hot sidewalks. Even in the winter though, a stroller is going to be your friend. 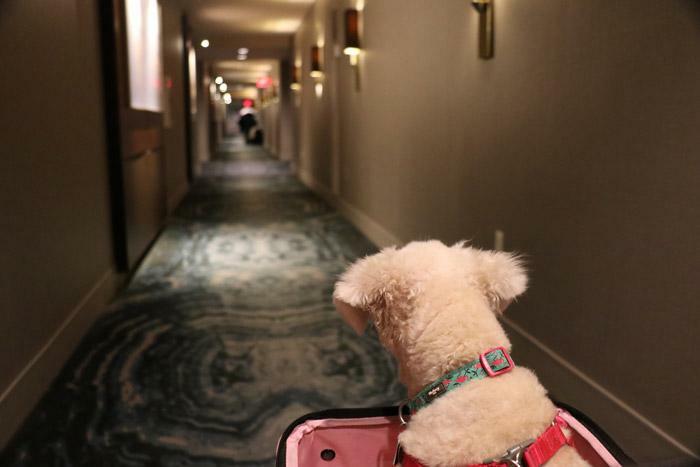 While Vdara and Delano both are much smaller resorts compared to others, the hallways can still be long and by putting your dog in the stroller it helps reduce the chance of accidents. This isn't just a benefit for you - but also for other guests with dogs since dogs tend to pee where other dogs have peed and that's just a vicious cycle. Additionally, make sure to take extra dog food, treats, toys, and a portable water bowl that you can bring with you on walks. Even when the temperature is cool, Vegas is the desert and has a generally dry climate so just like you, your dog will get dehydrated faster than normal. Finally, most pet friendly hotels in Vegas have an official policy that dogs must be crated when the owner is not in the room. As a result, you should invest in a travel friendly crate and train your dog to trust it before placing them inside while in a strange environment. Obviously, with the exception of service animals, dogs are prohibited from public areas of the casinos. As such, your opportunities on the strip are somewhat limited. However, The Park (located between Monte Carlo and New York New York) makes for a great dog friendly destination that you can visit together and joy a drink or meal sitting outside. It's also a fun spot in the summer since they have trees and shade sculptures to help you cool off. Off strip, there are more opportunities for dog friendly recreation. Depending on what you are looking for, this includes restaurants like Rachel's Kitchen and Crepe Expectations where dogs are welcome and Big Dog's Draft House also allows dogs on the patio. Just a few minutes off the strip, you'll also find some great trails to explore in Red Rock Canyon or Echo Canyon-Fossil Ridge Loop and of course, there are numerous dog parks throughout the area. No matter what you choose, be smart about your plans and don't just leave your dog alone in the room while you go off and party the whole time. Vegas has proven many times that there are all sorts of different adventures that await guests who visit, and a dog friendly visit to sin city is just one more opportunity to experience this amazing city and I can't wait to do it more often!